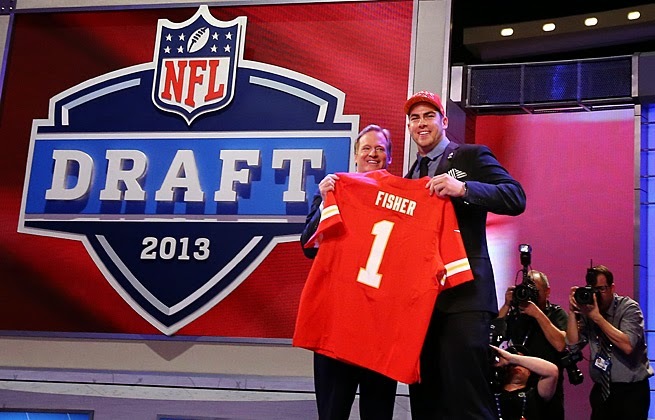 Yes, the Chiefs improved by nine wins from the first pick in the draft to a Wild Card berth, but Fisher largely struggled in his rookie campaign. Fisher started at right tackle for much of 2013 but he appeared to be largely lost for much of the year save for late in the season. However, he also fought through a number of injuries as well. Fisher is going to have to improve his play not only to justify his draft position but also as he becomes the new blindside protector of Alex Smith as he switches back to the left side. Joeckel only played in five games in his rookie season due to suffering a season-ending ankle injury against the Rams in October but when he was on the field, he played relatively well. Joeckel had played left tackle during his college days but was at right tackle for Jacksonville until Eugene Monroe was traded the week before Joeckel suffering the aforementioned injury. He is expected to be the left tackle for the Jags going forward. The Dolphins made a bold move to trade up nine spots from the 12th selection to the third to select Jordan but as I saw it, Jordan appeared to be a poor fit for Miami's 4-3 defensive scheme. And ultimately, I appeared to be proven correct. Jordan played much of the end at defensive end and he failed to make much of a difference all year. He did not start any games and only had 26 tackles and two sacks. Perhaps the team will either want to experiment more with 3-4 looks or try Jordan at outside linebacker in order to maximize his abilities. I felt that Johnson was pretty raw coming out of Norman but still quite talented and he showed numerous flashes of his talent during a relatively productive rookie season. Johnson started every game for the Eagles at right tackle last year and he held up pretty well while looking like a good fit for Chip Kelly's offensive scheme. He especially excelled blocking for a strong rushing attack and he should only improve with experience. Everybody and their uncles knew that Ansah was quite raw coming out of school but while he certainly can grow as a player, he should a lot of skill and a lot of talent during his rookie year. He was a solid pass rusher, totaling eight sacks which led all rookies, but he surprisingly played the run very well. Ansah should become a double-digit sack force going forward and he complements Nick Fairley and Ndamukong Suh very well on the Detroit defensive line. I was not a fan of Mingo coming out of Baton Rouge but he got off to a fast start, totaling three sacks in three games. However, he only had two more sacks the rest of 2013 and more often than not disappeared in Cleveland's 3-4 scheme. It will be key for new coach Mike Pettine to get the most out of the raw Mingo in order for his aggressive scheme to maximize the potential of the roster. One cannot place a grade upon Cooper's rookie season because he broke his left fibula in Arizona's third preseason game and was promptly placed on injured reserve a week later. The Cardinals were a little better at protecting the passer in 2013 but they still could have used the talent of Cooper to solidify their interior offensive line. The team will need him to contribute well this upcoming year. The St. Louis brass targeted the speedster from West Virginia and traded up from 16 to select him before somebody else (likely the next pick) could. However, Austin showed little more than flashes in a relatively disappointing rookie season as he only totaled 40 catches and 418 receiving yards. He will have to step up his game as Sam Bradford enters what is likely a make or break season for the former top overall selection. Milliner was expected to try to replace the shoes of Darrelle Revis, who was traded before the draft to Tampa Bay, but the season was largely a struggle for the Alabama product. Cornerback is traditionally a tough position for rookies, though, and Milliner showed some flashes in December as looking worthy of the high draft pick. The Jets have nothing else at corner so they will need Milliner to take some big steps in 2014. Warmack started the entire season for the Titans at right guard but he struggled for much of the year. He faced a slight learning curve considering he played left guard in college and while he had the reputation of being dominant in the running game, he was a relative disappointment in that regard for a club that struggled to run the football. He also had room to grow in pass protection as well, but he is a talented player so one should see improvement in year two. I was not a big fan of this selection last year because I thought this was a reach for a guy that could not play the left side. While I was right that Fluker was not a good fit to be a blindside protector as he really struggled the few weeks he was tried at left tackle, he was excellent when he was on his more natural position of right tackle. He proved himself to be a powerful run blocker and he should grow only better in that regard. As I mentioned earlier, cornerback is traditionally a tough position for rookies but Hayden really struggled for much of his rookie campaign. Hayden, who hadn't played since nearly dying midway through his senior year at Houston and missed much of OTAs due to surgery needed to remove some scar tissue, was burned rather often, particularly against the Eagles when he was scorched three times for three long touchdowns. It will be key what he does this year with a full offseason under his belt, but he has some work to do. The Jets really did not have a huge need for another defensive linemen but anytime you can land the Defensive Rookie of the Year, that is a job well done. Richardson was sensational for the Jets last year and was a core reason why the team was very good defensively against the run as well. He also made a bit of a living in opposing teams' backfields and even scored a couple of touchdowns offensively as a fullback. For a team that historically doesn't draft well, they nabbed a good one here. Lotulelei was the top player on my big board for last year's draft and after the rookie season he had, I was not left looking like an idiot. Lotulelei, along with fellow rookie Kawann Short, was an important part of a strengthened Carolina front seven that helped to power it to a bye in the NFC Playoffs. He did a solid job applying some interior pass rush but he was tremendous against the run. Vaccaro was a bit of a jack of all trades for the Saints in 2013, who were very good against the pass, and he played well seemingly everywhere and anywhere. He unfortunately missed the playoffs thanks to fracturing his ankle late in the year but he was a big-hitter and an immediate impact player. The future is bright for this Texas product, especially as he plays next to free agent signed Jairus Byrd going forward. I hated the Bills taking Manuel here, I was far from the biggest Manuel fan and I thought there were at least a few quarterbacks better than him (I listed Geno Smith (! ), Ryan Nassib and Matt Barkley (!!)). Manuel was pretty inconsistent as a rookie and also struggled to stay healthy and analytic sites like Pro Football Focus were not very kind to him. However, he did make some plays and improved down the stretch, which could give Buffalo some hope under center for the first time in a while. I had really high hopes for the Jones selection as he fell further than he should have in my opinion and he seemed like such a great fit for a team that needed a pass rusher. However, Jones was not able to see all that much player time and when he was on the field, he was largely ineffective. He only totaled 40 tackles and just a single sack. He is going to have to improve big-time this year if he wants to be a contributor going forward. The Niners have a big hole to fill at the safety position after Dashon Goldson signed with Tampa Bay and they addressed it by boldly trading up from 31 to take Reid. I didn't love the move at the time because I thought they could have taken Reid had they stayed at their original pick but the move paid off as Reid had an excellent rookie campaign. He was a playmaker and was a smart player as well. Reid could develop into a Pro Bowler in time. Another pick I thought was a reach was New York taking this Cuse product with the 19th selection. Pugh started the entire season at right tackle and he did struggle in the first half of the year. But in the second half, he really improved his play and he played well down the stretch. In fact by the end of the year, you could have made the case that he was the best Giants linemen. He was better against the run and pass and he looks like he can grow into a pretty solid lineman. Yet another pick that I thought was a reach turns out into a pretty fine pick. Long even turned into an alternate Pro Bowler, how about that? Long still has some work to do in the passing game but he did improve down the stretch in that regard. He also was solid in the run game as well. Long is still a little raw and has some work to do to reach his potential but he certainly has a nice start. Eifert did not come right in and overtake Jermaine Gresham as the top tight end in Cincinnati but he still had a solid rookie year, totaling 445 receiving yards on 39 catches with a pair of touchdowns. He showed that he can be a ideal complement to Gresham and looks like a good fit in the Cincinnati offense going forward as a fine weapon for Andy Dalton. The Falcons were obviously a disappointment last year, falling from 13 wins to a mere four. However, one of the few bright spots in the ATL was the rookie corner from U-Dub. He finished tenth in the league with 17 passes defensed and quarterbacks that threw at him only completed 53% with only a 75.2 quarterback rating. Pro Football Focus had him as their seventh-rated cornerback in all of the league. I was pretty surprised when Floyd dropped all the way to the 23rd pick and the Vikings but based on how he played in 2013, maybe some teams knew a thing or two that I did not. Floyd largely was a non-factor during his rookie season as he totaled 19 tackles and 2.5 sacks. He is a talented player but he has to improve his play going forward. However as he will be playing next to Linval Joseph instead of the declining Kevin Williams so he will have a shot. Werner was a guy that saw his stock slide during the pre-draft process despite his strong player at Florida State as many teams did not think that he would be a good fit for a 3-4 defense. And even opposite Robert Mathis who totaled a whopping 19.5 sacks, Werner was a non-presence all season long in Indianapolis as he struggled to see playing time. He only totaled 2.5 sacks and only had 13 pressures all together. Werner has some work to do to be a key contributor for a Colts defense that needs it. Rhodes did not total an interception during his rookie campaign and his season ended a few weeks early thanks to an ankle injury but when he was on the field, he looked good, particularly down the stretch. He made good decisions in coverage and showed some solid technique as well. We know that corners can struggle as rookies but it was a fine first season for the FSU product. When your playing time gets gradually decreased over the course of the year, and you are healthy, that is not a great sign and in the case of Jones, it showed that he was not all that impactful over the course of his rookie campaign. He provided some quarterback pressures particularly early in the year, but in the end he simply did not make a big impact for a Packers defensive line that could have used it. There were not a whole lot of positives in the disastrous 2-14 season for the Texans, but at the very least, they got a productive rookie campaign from the Clemson wideout. Hopkins had nice numbers of 52 receptions and 802 yards at a 15.4 average with mediocre at best quarterback play. Perhaps most impressively, Hopkins he only had one drop on the year. When Houston gets a quarterback again, look out for the Andre Johnson-Hopkins combo. Williams did not see that much playing time for the AFC West champs until late in the year when Kevin Vickerson got hurt, and when he did see the field he was solid. However on the whole, he had 19 tackles and only a pair of sacks. He will have to fight again to get some playing time but he did show some flashes down the stretch to where the team may be inclined to play him more. Patterson may have been pretty raw out of Tennessee but boy he was electric when he had the football in his hands. Most of the year he was utilized as a kick returner and he averaged an excellent 32.4 yards per clip and had a pair of scores. He was second overall in all-purpose yards with 2,020 and he when he saw more playing time offensively, he looked very good. You think they miss Percy Harvin? Me neither. Ogletree's rookie season was relatively mixed as Pro Football Focus graded him positively and negatively in eight games each. However, he was always on the field and was a key defensive contributor for Jeff Fisher and the Rams. He forced six fumbles, had 12.5 tackles for loss and defensed 10 passes but he does have to improve his tackling as he missed too many. A lot of folks criticized the Cowboys for reaching for this Badger but in the end, it actually turned out to be a good decision as Frederick had a very positive rookie year at a key position on the offensive line. He was tremendous in the run game even as Dallas struggled in that capacity. However, it will be important for him to improve in pass protection but all in all, a solid pick for Jerry Jones. Elam's strengths coming out of Gainesville were in run support and playing near the line of scrimmage. He was thought to be able to develop as a fine cover safety but he really struggled in that regard as Baltimore had him play more as a center field type. He did have a solid rookie year but look for Baltimore to play more towards his strengths in the box.